There are small, really unimportant things in life that sometimes make you smile, or that you at least find amusing and add to your day. It can be difficult to put your finger on why, exactly. 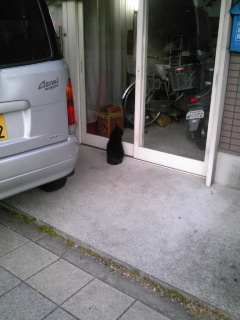 One little thing that I think I may miss when I leave Japan is seeing this black cat on my way to my part-time school. It's often sitting outside this building, looking inside the sliding door. Sometimes it rests underneath the car parked outside, and every now and then it's inside looking out. But most of the time when I see it, it's just sitting there, ignoring the world around it, studying the door or inside. You said "when" you leave Japan... Are you already planning an exit? Heh...good catch. I haven't written about it, but yeah. I decided recently not to extend my JET contract, and I'll be returning to America.